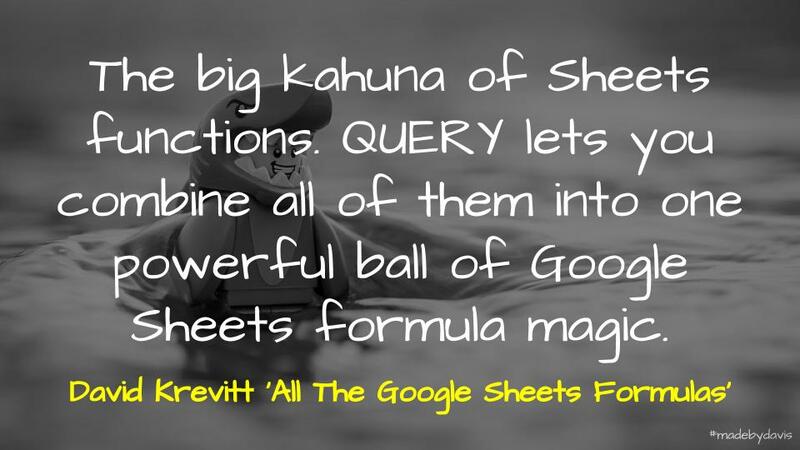 There are many challenges to sharing specific data in Google Sheets, some of these can be overcome using the QUERY formula. I attended a day recently continuing the look into ongoing reporting. One of the focuses involved reflecting on various points pf data. Something that stood out was the willingness of teacher to share data. Whether it be with students, teachers or parents, for some providing access can still be a challenge. I discussed this with a principal attending the day and one suggestion made is that it can be hard to share particular data, without sharing everyones data. This is especially the case when talking with parents or conferencing a student. An answer is using the QUERY formula. With Google the chosen platform, a lot of teachers store their data in Google Sheets. QUERY combines all of the capabilities of arithmetic functions (SUM, COUNT, AVERAGE) with the filtering abilities of a function like FILTER. It is a language developed by Google, using the principles of Structured Query Language (SQL). If you wished to quickly create a tab for each student, Alice Keeler has created a script for generating tabs from a list. This personalised information can then be shared with students (see Jake Miller’s explanantion). Another thing to consider is to protect formulas by adjusting permissions at a celular level, as well as prevent others from copying the file, therefore getting the information that way. These options might be used when working with colleagues or talking with parents. You are able to bring up just the information required. Depending on the data, you can also create dynamic charts. One other benefit to using the QUERY formula is that it allows you to quickly and easily reorder the representation of data. So lets say ‘F’ is associated with literacy testing and you would like that at the start. Rather than writing SELECT C,D,E,F you would write SELECT F,C,D,E. This is only the tip of the iceberg of what the QUERY formula can do. For more information, see posts from Ben Collins and David Krevitt. Collins also ran two webinars, which you can go back and watch. One on the basics, while the other getting a bit more complicated. One thing to note when using Google Sheets to store data is what sort of information you are collecting. In some districts and regions there are issues raised about storing ‘sensitive data’ in platforms like Google. The ‘sensitive information’ contained in ClassDojo is the behavioural record built up from teachers tapping reward points into the app. This same concern needs to be considered in regards to Sheets, especially with the changes being brought about by GDPR. As always, comments welcome. Webmentions too. Responding to Holly Clark, I explain why I cringe when the concept of digital literacy is replaced with fluency, subsequently overlooking the plurality of digital literacies. There has been a lot written about digital literacy of late, much of the conversation stemming from the Engagement in a Time of Polarisation MOOC and danah boyd’s keynote at SXSW. Holly Clark enters this conversation explaining why she chringes when she hears the word ‘digital literacy’. 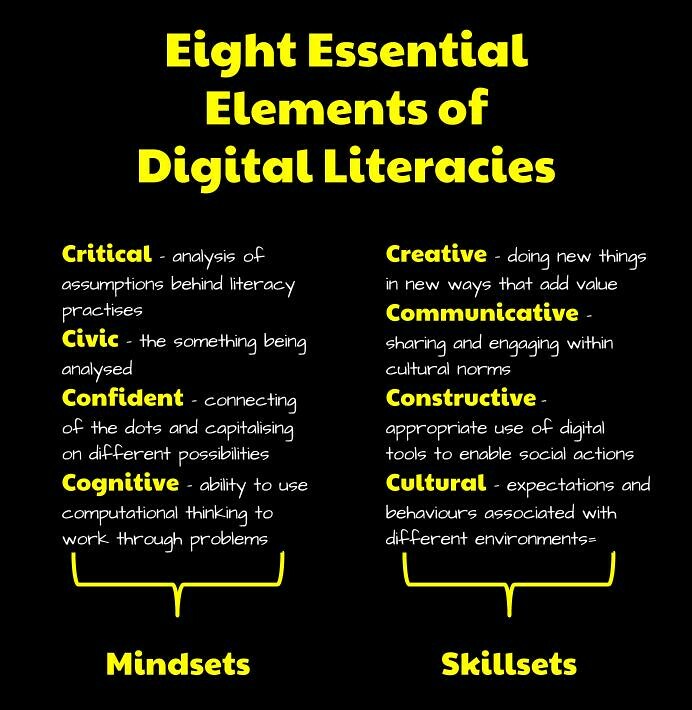 What students don’t possess most often is a not digital literacy, but rather digital fluency. As educators if we spend our time talking about literacy – and what feels like ONLY literacy – and we leave out the more educationally important idea of fluency we might be doing students an injustice. Fluency is the term that SHOULD be at the heart of everything we are talking about. It is where the transfer of knowledge happens, where kids apply that literacy they developed without our help, and get past the making meaning stage to a place where they are transferring knowledge on their way to becoming effective digital citizens and learners. I agree with what she is saying, it is not our knowledge of these things that matters, but rather application of such knowledge. Therefore, I can know about two-factor authentication, which by her definition would be a part of being ‘digitally literate’. Tick. However, unless I actually apply two-factor to each of my accounts then it is of little use. The particular example that Clark gives is that of searching. As she explains, you cannot have an knowledge of a search (or a query) unless you understand the consequences and to do so you would need to be fluent, not literate. The question we should be asking as educators is – are they fluent in search? Do they know how to craft a search that will deliver to them a page of really meaningful and purposeful results – results that come from mostly credible sources? Do they have the fluency to evaluate the information the search produces. I promise you the answer is no in 98% of cases. There is a fluency to search, to knowing what happens when you add quotes, or the minus symbol, or keywords and how this all affects the end result. This is the digital fluency of understanding the intended message (or query) you are delivering to Google. As Clark highlights, simply knowing to use quotation marks is not enough, we need to understand why this is the case. Although I am not as confident as Clark to call out ‘98%’ as the number, I think that this difference between knowing and understanding is a consequence of a tick-box approach to many of these things. There are great programs like eSmart’s Digital License, which help build knowledge. However, like many licenses in life, it can be a means to an end. The question is often what happens once they have their license that matters. Again, if they find out about the importance of two-factor and security, but continue to use their dogs name as their password, then it is to little avail. My concern with Clark’s argument is that she puts ‘digital literacy’ to the sword, replacing it with ‘fluency’. This is problematic on two fronts. Firstly, the concept of literacy is not fixed. Secondly, we are better considering the plurality of digital literacies. 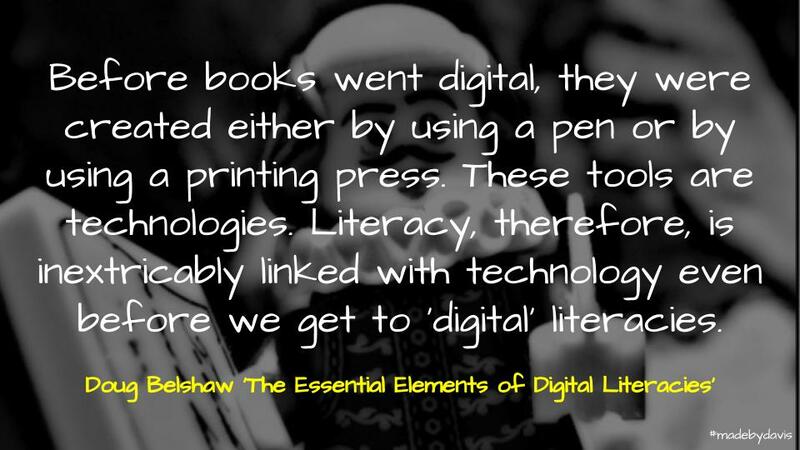 In The Essential Elements of Digital Literacies, Doug Belshaw suggests that literacy involves using a tool for a particular purpose. using a pen or by using a printing press. These tools are technologies. Literacy, therefore, is inextricably linked with technology even before we get to ‘digital’ literacies. Adding the ‘digital’ modifier increases the ambiguity associated with the situation. 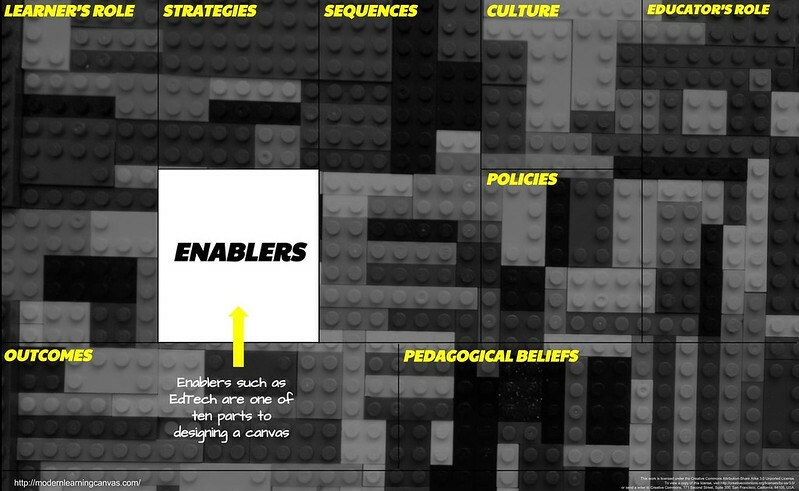 Instead of providing an overarching definition, Belshaw provides eight elements to make sense of the different incidences of digital literacies. Cultural – the expectations and behaviours associated with different environments, both online and off. Cognitive – the ability to use computational thinking in order to work through problems. Constructive – the appropriate use of digital tools to enable social actions. Communicative – sharing and engaging within the various cultural norms. Confident – the connecting of the dots and capitalising on different possibilities. Creative – this involves doing new things in new ways that somehow add value. Civic – the something being analysed. What is important here is that we cannot meaningfully consider all these elements at once. Each offers the possibility of digging deeper or stepping back. Take for example searching online. We can confidently search for information. This is what Clark captures with her discussion of ‘fluency’, However, this does not necessarily capture the critical side of search and algorithms. Interestingly, Clark makes mention of the plurality of literacies, but never quite explains what she means. In the end, what is needed in this area is more conversation. It is complicated. It is contested. As always, comments, criticism and cringing welcome. 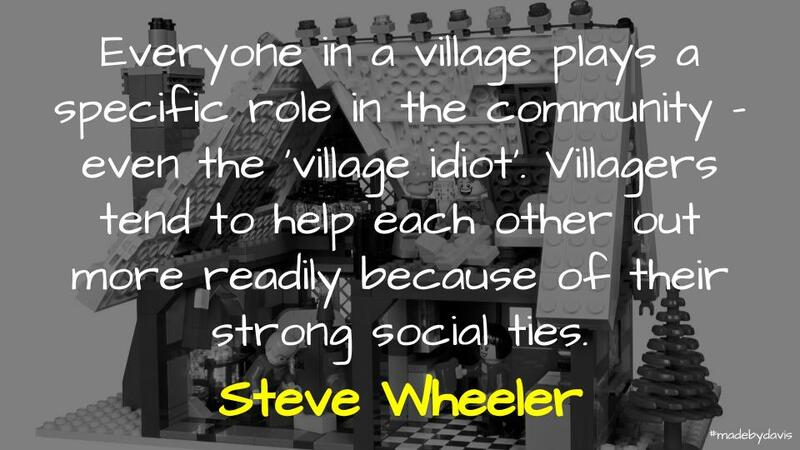 Life can get busy, when this occurs, should leaders stand aside or do we need to stop and recognise that sometimes leadership involves the support of wider support networks? The question I am left with is what happens when a leader can’t keep these aspects in tact? Not for the lack of trying, but rather that life does not necessarily allow for it. Maybe it is raising a young family, suffering from illness or balancing life situations. Should leaders stand aside or does it sometimes take a team? Discussing the challenges of balance, Corrie Barclay shares a number of tips associated with raising a family while also being an assistant principal. These include doing what you say you will do, learning to say no, making time for you, mindfully moving around and living life to the fullest. Barclay’s post was a response to a post from Eric Sheninger on the same topic. For Sheninger, worklife balance can be broken down into three areas: professional, family and personal. Some of his strategies for answering each of these areas is to consciously block out time for things, think about eating patterns and cut back on social media. He also states that sometimes you need to be selfish. Our well-being is not only good for us on a personal level, but it has positive impacts on our professional work and family life. When Sheninger was a principal he would leave early in the morning in order to fit in a gym session before the start of the day. Chris Wejr provides his own take. His answer has been to remove email, as well as schedule his family into his calendar. For Steve Brophy the challenge is the transition from one mode to another. He does this through the use of a routine when he arrives home, where he gets his clothes ready for the next day, writes a few notes and leaves his phone in the bedroom. This then allows him to give his best to his family. Taking a different approach, John Spencer has his own solution to the personal problem. He and his wife give each other one night a week to pursue other interests. This means going somewhere else, whether it be Starbucks or a microbrewrey, and focusing on something unrelated to teaching. What each of these situations and suggestions demonstrate is that there is no quick fix to finding balance. Whether it is food, scheduling or space, each approach is based on a particular context. Having said this, there is one thing that ties them together. The part played by our wider support networks. Other than John Spencer, there is little mention of partners and their part in the play. Although Eric Sheninger identifies family as an area that is a part of the balance, he does not touch upon their particular influence. Steve Brophy recogises his wife’s role on his ‘learning board of directors’, but not necessarily what this involves. Like Sheninger, I too used to exercise early in the morning. However, I now choose to help out at home, before dropping my children off at childcare. My wife is in leadership and I feel that it is important to help out where I can. Returning to the beginning, Browning talks about what leaders are able to manage. Similarly, Philip Riley highlights the stresses that principals are put under. What seems overlooked in both accounts are the structures often in place that allow leaders to prosper and the sacrifices made by those within the support networks involved, such as family and friends. Reflecting on guilt of not always being their for her children, Pernille Ripp recognises the role played by her husband in allowing her to do what she does. Maha Bali is another who explains the need to say no to various requests because she is also a mother. While when she does present, this often involves a team of carers or her daughter actually attending various events. Although neither are explicit leaders of schools, they are still leaders in their own spaces. I wonder then if the greatest challenge we face in regards to leadership is realising we cannot do it alone and recognising those who help out to make it possible? As always, comments, criticism and communication welcome. 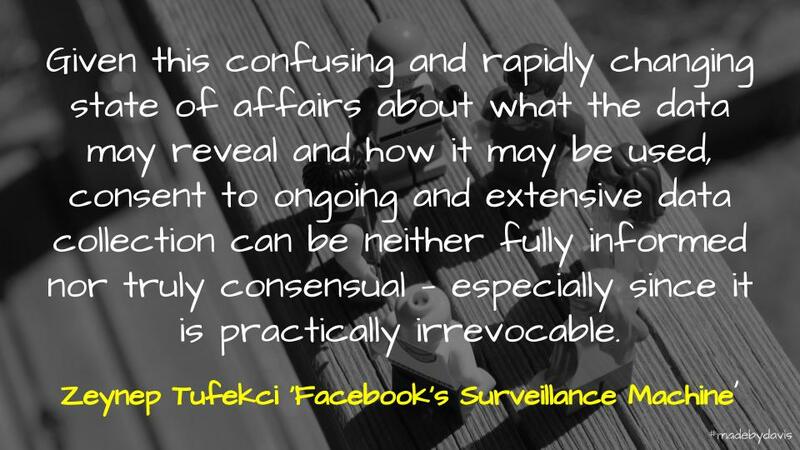 There have been a lot of discussions lately about Facebook, social media and connected society in light of the Cambridge Analytica revelations. Here are my thoughts on what it might mean to be more informed consent. Is it secret, is it safe? Still unaware of the ring’s power. Gandalf explains to the hobbit the gift he has been bestowed and the journey he must go on. Are we secure, are we safe? Our responses to this can go in a number of directions. On the one hand we can don our silver suits like Chuck in Better Call Saul and become possessed by fear. Or we can become completely paranoid like Elliot in Mr Robot, where we always think the worst and react accordingly. We need some sort of compromise. We need to, together, demand better. I have been thinking lately, with fake news and data breaches, maybe we are entering a new era, what Belshaw mooted as an ‘informed era’. Although there has been a call for companies to improve the clarity of their terms and conditions and governments to put in place policies to protect citizens, I think that ‘informed consent’ needs to go beyond that. 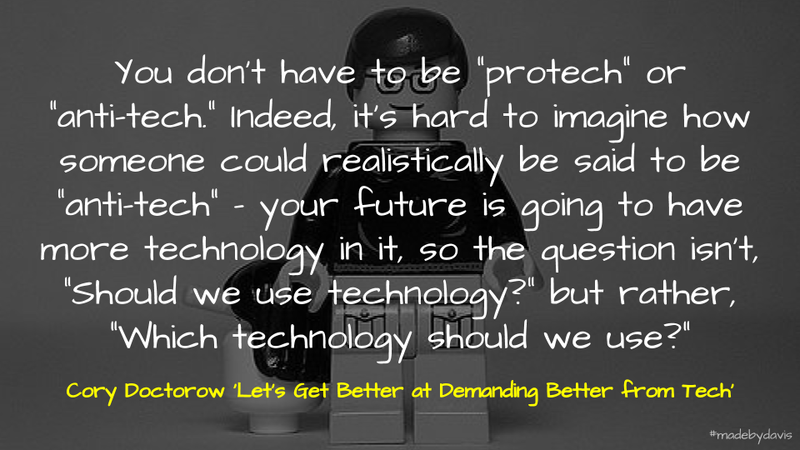 If we are to demand better then the conversation needs to go beyond the features and affordances of digital technology. For tools themselves are just one actor in a larger play. A useful framework for making sense of technology is Belshaw’s Eight Elements of Digital Literacies. Split between four mindsets (Critical, Civic, Confident and Cognitive) and four skillsets (Creative, Communicative, Constructive and Cultural), these elements provide a means of appreciating the complexity at work. These elements though do not provide a checklist to tick off, but rather the start of a richer conversation. They should not considered all times, but they help in realising that there are always other aspects to consider. Take for example an application like Hapara. It provides an added layer of control on top of GSuite, which allows teachers to organise and manage learning in the classroom. 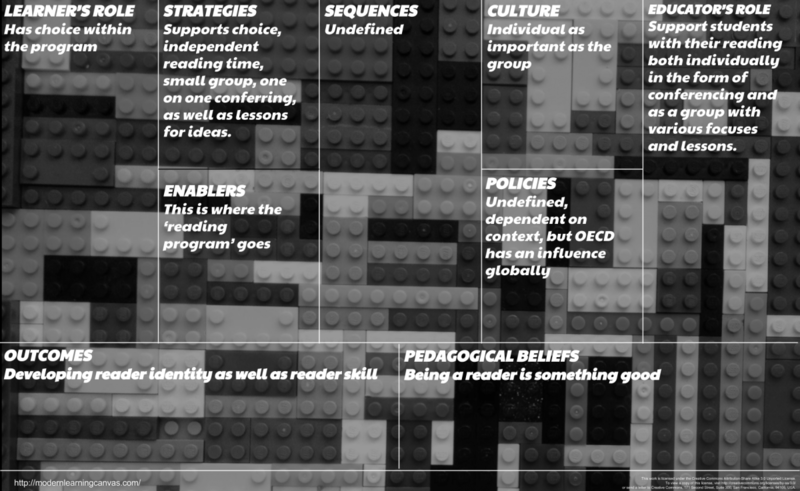 Using digital literacies as a lens provides an insight into a number of aspects which help to inform our use. From a cultural perspective, Hapara posits that teachers are largely responsible for creating the conditions for learning. Cognitively, it involves new ways of working. Although it may be more efficient, if you have been using GSuite, these are still habits to unlearn and relearn. Constructively, there is a blur between empowering students with the power to participate in actions and the dangers in excessively moderating their learning. From a communicative point of view, GSuite allows a number of ways to engage, Hapara provides the means to manage and moderate this within different cultural norms. Connecting with GSuite through the use of APIs, Hapara has the ability to both hinder and help the creative process depending on how it is deployed. From a critical and civic point of view, it is important to consider why there is a need to manage learning at all and the consequences associated with such actions. What this example highlights is that you cannot meaningfully consider all these elements at once. Each offers the possibility of digging deeper or stepping back to develop a wider perspective. Advertising has shaped our culture. Not the ads, but the money. And Facebook’s woes are a symptom of that. Being informed is not some sort of process where one day you wake up certified. This is a problem with things like cybersafety programs. They are often designed to get everyone to a particular level of knowledge, but fail to address the mindset and ongoing practice. The real problem that needs to be addressed is what next? The challenge as I see it is to understand that consent is something that we inadvertently give each time we tap into an application. I would argue then it is a constant state of becoming more informed. In an ever changing world, with goals forever moving, it is a case where we can never quite be fully informed. Here then are some strategies to start with. I think that the most important thing we can do is wonder. This helps go beyond the how-to to the how-do-they-do-that. Ian O’Byrne has written a useful series of posts with questions to consider in staying safe online. He touches on issues such as passwords, backing up and protecting your connection. In part, I think this a part of the push for computational thinking. For me, being informed takes a village. If we are to ask questions, then it is useful to have people to talk about them with. Dean Shareski wrote a post a few years ago that that has really stuck with me. In it, he spoke about leaving conferences with new connections, not just new content. I think that this is important. Meeting people beyond your own context helps extend your thinking and develop new ideas. Reflecting upon his digital workflow, Clay Shirky talks about each year getting rid of perfectly good habits. He fears that if he doesn’t he will stop noticing the ever changing digital environment around him. For me, such change starts with reading widely. There are so many places to find content these days. Whether it be on social media or reading books. I am an advocate for feed readers. All you need to do is find a few interesting sites, add the feeds and you are away. So to come back to the start: “Are you secure? Are you safe? And are you informed?” Maybe the answer is actually the question itself? As always, thoughts and comments welcome. With the move to platforms like Patreon, it leaves me wondering about the impact on the wider community. I opened my feed today to find Doug Belshaw has made the move from Gumroad to Patreon. After the recent glitch involving fees, it seems that there is a growing move to the platform within the group of people I engage with online. Patreon offers individuals the opportunity to provide a more profound level of support: donors aren’t just supporting art; they’re supporting a person, an art style, or an idea. The measure of Patreon’s success isn’t creating an army of full-time creators with middle-class incomes where none existed before: it’s ensuring that the money generated by art goes primarily to artists. It’s not your turn to win, or your turn to be picked, or even your turn to be guaranteed gratitude … it’s merely your turn to give a gift. For me, this comes back to Bill Ferriter’s warning about chasing wider audiences. However, it also touches on his idea of ‘bringing your own audience’. For Belshaw, this allows him to provide a more uncensored side to his patrons. 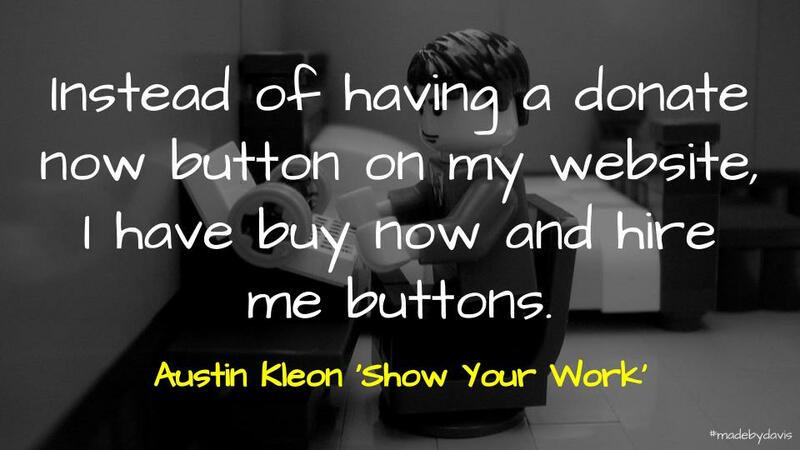 Instead of having a donate now button on my website, I have buy now and hire me buttons. I know people who run multimillion-dollar businesses off of their mailing lists. The model is very simple: They give away great stuff on their sites, they collect emails, and then when they have something remarkable to share or sell, they send an email. You’d be amazed at how well the model works. This “market research” of giving away e-books sells printed books. What’s more, having my books more widely read opens many other opportunities for me to earn a living from activities around my writing, such as the Fulbright Chair I got at USC this year, this high-paying article in Forbes, speaking engagements and other opportunities to teach, write and license my work for translation and adaptation. My fans’ tireless evangelism for my work doesn’t just sell books–it sells me. Although Doctorow does have a place for ‘donations’, it is so that you can buy a copy for a library. This approach to giving stuff away is an approach I have taken. I blog, I help out where I can, I share, inspired in part by Kleon and Belshaw. I started a monthly newsletter. This is as much about connecting ideas within the community as it is about promoting my own work. Maybe one day I will have something else to offer, then I will reach out and share with my supporters. Until then, I will keep on giving stuff away. Micro.blog: I do not pay for Micro.Blog and did not support the Kickstarter campaign. I neither want my blog hosted on Micro.Blog, that is what I pay Reclaim Hosting for, nor do I want to use Micro.Blog to syndicate, I use SNAP for that. However, I am happy to pay and support Manton Reece’s book once he finishes writing it. Visual Thinkery: I paid for Bryan Mathers stickers. Truth be known, because I love his work. In a strange way, it made me feel a part of the Visual Thinkery tribe. I am yet to use most of them though. However, I use the sketch he made me in my signature, as well as for my newsletter. To me, how I use them is not necessarily the point. It supports Bryan to do more work, that is what matters. Ben Collins: I read Collins’ blog and subscribe to his newsletter/mailing list. He gives away a lot and is always willing to clarify any technical queries. Subsequently, when he announced that he was developing a self-paced course on Pivot Tables, I was there. I started it, but got distracted. I know that I will get back to it eventually, but I also know that I am supporting Collins in a small way to keep on doing his work. Maybe this is just me? Maybe it merely reflects my privilege of having a contract, rather than living from one gig to the next? Maybe my stuff is not worth selling? Maybe I am just missing something? As always, comments welcome. One of the challenges with the web can be managing content across multiple sites, one answer, create canonical links and share from there. Argh. Yeah that is the bane of my existence. All are on Instagram from past 2-3 years but that’s unsearchable unless I’ve added a unique tag. If you have any suggestions I’d love them. We’re yiu looking for a particular one I could send? I am sure there are more I may have missed, but it paints something of a picture. Added to this, not only does she frequent these social spaces, but often in different guieses as well. One of the things that interests me about Amy’s work is that there is not necessarily a central space. If anything, I would say that it is her WordPress.com blog, but there is not a space where all the different parts are collected together. Although she also has her main site – amyburvall.com – this is more of a landing page design to connect, rather than collect. Douglas Rushkoff recently made the case against social media being used in schools. I agree with this and wonder we more schools do not create their own spaces. However, I also think that schools on the whole should do more to own their presence. What if they actually collected together their media story in one space. I think that Burvall faces that same conundrum. Dries Buytaert’s graphic provides a useful breakdown of the differences. I remember when I started down the POSSE path, my focus was simply on my long form posts. I would use Jetpack to share links to Twitter and Google+. This approach however has its limits. Firstly, Jetpack only provides a certain amount of social media sites provided. Secondly, it does not allow for much nuance in regards to content and how it is shared, particularly with media. The template is set within the code of plugin, with links sent out automatically. There are some ways to manipulate this, whether it be in the text box provided or by adding an excerpt, (an optional field in WordPress.) However, it is neither clear nor consistent. Having spent some time with Edublogs/Global2, I learnt that Jetpack can be modified. I am not aware though how much you can adjust the code associated with sharing links nor anyone who has done this. 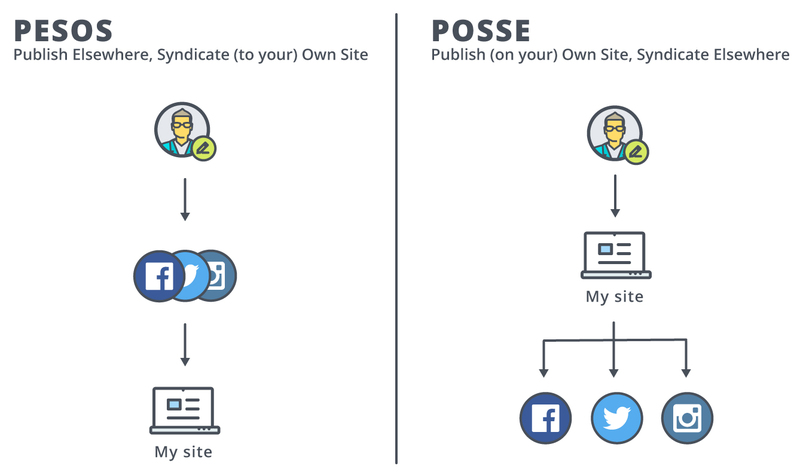 Another automated approach to sharing is through the use of a third-party platforms. The easiest and cheapest of these is IFTTT. It allows users to set up ‘recipes’, connecting various services together. These simply run in the background. Although IFTTT provides more choice, this can still be limited. There are times when you have to work with the options available to rethink what is possible. I am also sceptical how IFTTT are making their money and whether they will pivot like Storify. A similar third-party platform is Zapier. What is good about Zapier is that it really breaks down the various options clearly. The only catch with Zapier is the cost. An alternative that does not rely on a third-party platform is SNAP (Social Network Auto-Poster). This WordPress.org plugin connects with a range of applications within your own site. Although the setup is not as simple as Jetpack or IFTTT (you are required to get your own API Keys), there are clear instructions provides to walk users through connecting each application. Although many talk about the power and potential of automation to aid us, sometimes we need to step back and ask ourselves what this means and where the limits lay. iMovie Movie Trailor – I have used these templates myself and with my students. What is useful about them is they provide a clear structure to riff off. Lumen5 – I have made a few videos with Lumen5 to summarise longer posts. It reminds me a bit of Haiku Deck. Adobe Spark – Made up of a suite of apps, Adobe Spark makes it easy to generate quick and easy images, posts and sites. In regards to video, I like that you record the audio for each slide, rather than one file across the whole video. Not to be confused with restraint which is much more about self-control, constraint is about finding the edges of the page before you begin, it is about knowing what limits you have in terms of resources. The challenge with all of this is being thoughtful about how these generators are used. Johnston touches on this in regards to Micro.blog and using his site to syndicate to various social media siloes. He shares how although some tasks take a little bit longer, however he feels that he has inadvertently approached things with more care. I too have taken this approach recently. I have taken to using SNAP to send out links and have them syndicated on my site. This all involves a semi-autonomous setup. I sometimes wonder if the best generator at times is in fact ourselves? Fine, we might use various tools to offload the physical labour, however they are associated with dynamic choices and actions. This is what I do with the creation of my images. I could probably automate this, especially with the addition of add-ons to Google Slides. This would then involve populating a spreadsheet or even a Google Form and applying this to a template. However, I feel that I have the process downpat that there is something in the generation that I actually like. Therefore, the automation in this situation comes in the form of process. In a recent article, Antone Martinho-Truswell discusses automation and the way in which it seperates us from other animals. What stood out from his piece though was that automation has two parts: mental and technical. 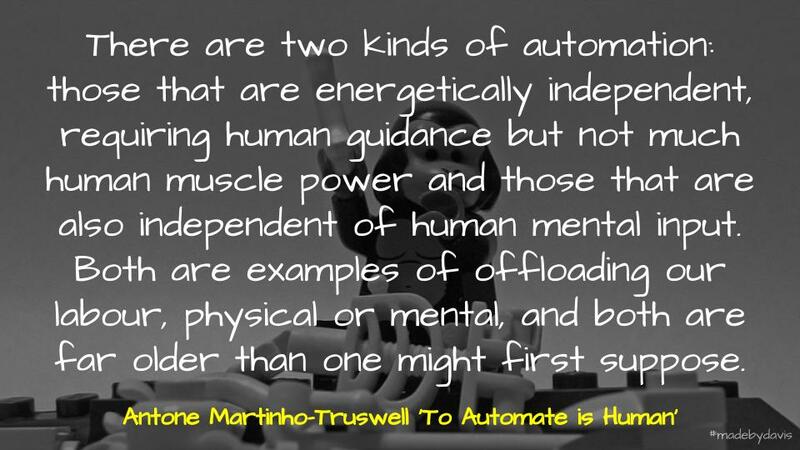 There are two kinds of automation: those that are energetically independent, requiring human guidance but not much human muscle power (eg, driving a car), and those that are also independent of human mental input (eg, the self-driving car). Both are examples of offloading our labour, physical or mental, and both are far older than one might first suppose. Too often the focus of automation is on the tool, yet there are infact other components that are overlooked. To me this is the ‘human’ side of things that people like Douglas Rushkoff and Kin Lane touch upon. Take for example, reading online. There are some who advocate for the Chrome App TLDR as a way of improving comprehension. The problem with this is that it has its limits. Firstly, the tool does not teach you how to summarise, nor does it address every piece of text on the web. 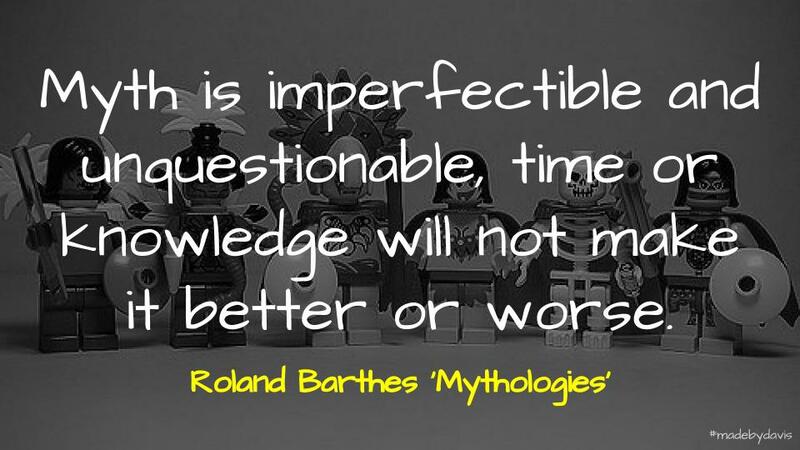 Instead, there comes a time when you have to draw on your own questions and protocols to help make sense of things. Generators are good, but they have their limit. What is important though is that we never let go of the ability to think through things from scratch. This is the key to embrace both sides of automation, the physical and the mental. For sometimes all elements are needed to find the edge of the page and work from there. So what about you? What are your experiences with automation or online generators? As always, comments welcome and webmentions too. Toca Boca is a suite of applications that provides spaces within which to explore and play. 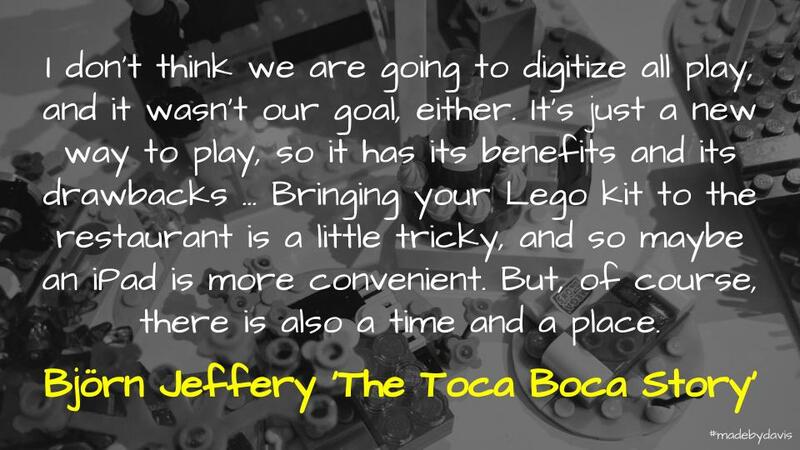 I don’t think we are going to digitize all play, and it wasn’t our goal, either. It’s just a new way to play, so it has its benefits and its drawbacks. Obvious benefits are that it’s portable, so we do very well on airplanes or dinners, for that matter — situations where parents need to occupy their children. Kids get super-bored after fifteen minutes at a restaurant, whereas parents want to sit for another two hours. Bringing your Lego kit to the restaurant is a little tricky, and so maybe an iPad is more convenient. But, of course, there is also a time and a place. Town: Users move between a shop, police station, a house and a park. Each space includes different characters and objects to engage with. Kitchen: Working between the fridge, a bench space and a cooking area, users prepare various meals. Through this process they are able to learn about how different produce changes when it is cooked, chopped and blended. Car: Given a small car, users drive around within an environment that has various objects and obstacles jump over or avoid. Band: There is a stage with three tiers, each with their own intensity. Each character plays a different instrument, which users can drag around the stage or they can placed on the top pedestal which allows users to control the particular instrument. Hair Salon: Using a range of tools and products, including scissors, dryer, coloured spray and magic liquid which makes hair grow, users are able to create their own hair styles. Once complete, they can then create their own hairdos. Fairy Tales and Tailor: Users choose clothes, apply various patterns and then accessories in the development of their own characters. They can also capture a snapshot of their finished creation. Lab: Users are provided with a virtual laboratory within which to explore the elements of nature in a fun and playful way. Through a range of virtual experiments, users heat, boil, spin and cool various objects to see what happens. Birthday Party & Tea Party: These apps allow users to lay out a table cloth for a party involving cake and drinks. This can be either played collaboratively or individually. Once someone has eaten or drank what have, you can then give them more. In addition to this, every so often something will spill which you need to clean up before doing anything else. Builders Lab: Something of a take on Minecraft, users are given a blank space on which to build upon. There are a range of robots to help you, each offering a particular skill, whether it be creating a block, moving a block or painting the space. Nature: Similar to Sim City, you are given a plot of land which you can add vegetation too, create mountains and dig out waterways. Once this is done, you can zoom in and go in search of the various flora and fauna that inhabits this created space. There is a range of objects you can collect and then feed the various animals. When you find something there is the option then to take a picture of your discovery. Active play, which is like chasing each other, playing sport, running around. Make-believe play, which is imagination and role play. Manipulative play, which is puzzles, construction, building, Lego, making, creating. Creative play, which is arts, crafts, drawing, music. Learning play, which is games and books — they are defined as learning because they are linear. They have a beginning, a middle, and an end. This collection is continuing to grow and evolve. So what about you? Are there any open-ended applications that you or your students use? As always, comments welcome. A collection of ways Google G Suite for Education can be used in the library, including the creation of digital spaces, supporting research, organising thinking and making connections beyond the classroom. A significant change in recent times has been the development of virtual spaces. David White describes this intersection between the physical and digital as a coalescent space. Google provides a number of options including: Sites, Plus, Classroom and Blogger. Each application has its own set of features and affordances. (New) Google Sites is a static website builder that allows a lot of drop and drag. It offers a number of possibilities. It is also now found within Google Drive and allows users to embed a wide range of content. One of the limitations is the ability to converse and the use of mobile platforms to create and update. Another option is Google Plus. Like Facebook and Facebook Pages, Plus provides the means to create communities where people can meet and share. These can be both public and private. Additionally, Plus allows users to organise resources in collections. A development over recent years has been Google Classroom. This space allows many of the features of Plus communities, but in a closed environment. A recent addition to classroom has been the ability to engage across domains. The original Google space is Blogger. One of the original blogging platforms, Blogger allows for an open and dynamic presentation of content. This could be a shared space for different writers, a place to collect links or a space to document news and updates. There are so many options for spaces. However, rather than choosing one or the other, sometimes the best option is combining different solutions, whether it be a Site and a G+ community or a blog and a Classroom space. Learning professionally with Google+ Communities – Camilla Elliott explains some of the benefits of Google+ Communities for sharing and collaborating. This is seen as an alternative to other spaces, such as Facebook Pages. Triple Differentiation in Google Classroom – Beginning, Middle, and End – Eric Curts demonstrates how Google Classroom can be used to differentiate learning. This post also explores many of the newer features, such as setting specific work for individual students, incorporate different resources and allow students to submit a wide range of products. The Many Faces of Blogging – To make sense of the possibilities afforded by blogging, this post identifies seven different approaches to help in developing a deeper understanding. Communities, Networks and Connected Learning with Google – An investigation into the technology associated wtih the development of digital communities and networks inside and outside of the classroom. Ngram Viewer allows you to compare the language captured by Google’s attempt to digitise the world’s libraries. Trends provides a way to filter and frame Google’s search data, this includes the ability to visualises current searches. Google News goes beyond microfiche to archive hundreds of newspapers from around the world. This book also explains how to use Google Books to track down quotes and use reverse image search to find the origin of an image. To support these strategies, Caulfield also started a new site, Four Moves. This has been designed to provide prompts and practice to support students with the act of fact checking. It is often stated that the best firewall is the human sitting using the computer. That is part of the reason Google developed Be Internet Awesome, a program designed to support students to be better online citizens. It is organised around five fundamentals – being smart, alert, strong, kind and brave – and mixes together a curriculum with a series of game-based activities. It is important to note that Digital citizenship can mean many things to many people. Sometimes the best thing to do is start by defining what it means within your own content. Google Search Presentation – Anthony Speranza provides some tricks to making the most of searching with Google. Be Internet Awesome – A range of resources developed by Google to help kids be safe, confident explorers of the online world. Web Literacy for Student Fact-Checkers – Mike Caulfield provides a range of strategies, tactics and tools, which, properly used, can get students closer to the truth of a statement or image. Four Moves – A collection of activities to support Caulfield’s work with fact checking and digital citizenship. The traditional perception of the library are rows and rows of books and with this the age old practice of standard book reports. It would be therefore easy to use technology to just reproduce this. The problem though is it fails to recognise new possibilities associted with the various features and affordances. One possibility is to explore place using the range of geo tools. Whether it be plotting a narrative with Google Tour Builder, going on a Lit Trip with Google Earth, collating books from around the world with My Maps, exploring places with Google Cardboard or testing your knowledge with Smarty Pins. Another potential is to use Google Forms to gather student reviews and then publish these with Awesome Tables. These reviews could even be audio or video recordings, collected using the file upload question format. Videos could even be played within a Google Slide, therefore avoiding the need to upload to YouTube. HyperDocs provide another way of rethinking how students respond to books. They are documents which incorporate different interactive activities, usually involving a range of choice. They help provide the structure for self-determined learners. A creative activity involving hyperlinks is the making of a ‘choose your own adventure’ story. Another format to support thinking and research is the Iron Chef Lesson Plan, which involves working collaboratively to develop ideas and understanding. HyperDocs and the teacher librarian – Joyce Valenza provides an introduction to HyperDocs and how they might apply to libraries. Choose Your Own Adventure Stories with Google Docs – Eric Curts provides a guide to creating a Choose Your Own Adventure Story. My Tables are Awesome – John Stewart explains the power and potential of Awesome Tables to organise data and information. 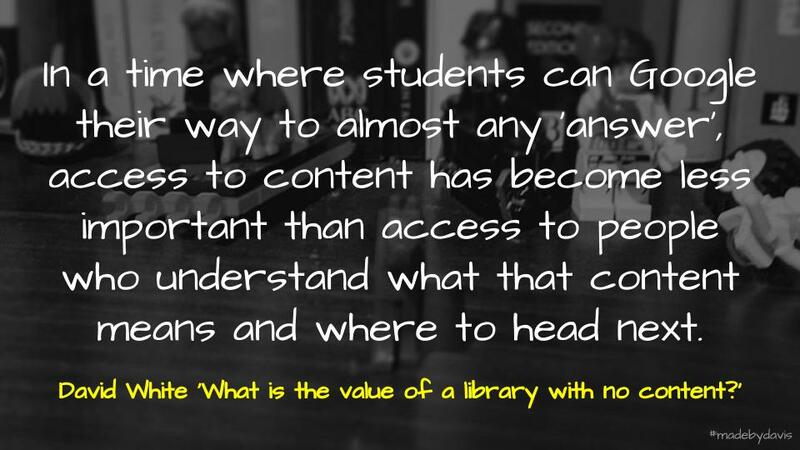 Libraries are often the space within a school which provides the possibility to go beyond the subject silos. In regards to curriculum, this provides the opportunity to explore other areas, such as the critical and creative thinking curriculum. Google provides a number of ways to make our critical thinking visible. This can come in many formats, whether it be conducting brainstorms, organising ideas using graphic templates or representing understanding using infographics. For creative responses, you can make poems or digital comics. Two tools useful for working collaboratively with text and visuals are Drawings and Slides. Gone are the days of libraries being silent spaces dedicated to independent reading and reaearch. Now they are spaces design to spark conversation and creativity. A part of this is the inclusion of makerspaces, but another change is the addition of games and a focus on collaborative problem solving. One possibility in this area is BreakoutEDU. Based on the escape room, BreakoutEDU provides a way of engaging with the wider space, but they can also be a way of developing critical thinking. An extension of this are digital BreakoutEDU experiences. A Guide to Visualisations – A summary of ten different forms of visualisations and how they can fit within the classroom. 30 Free Google Drawings Graphic Organizers – Eric Curts shares a collection of graphic organisers created with Drawings. The Next Awesome Thing In Your Classroom – Digital BreakoutEDU – Tom Mullaney provides a twist on BreakoutEDU by making them digital. The move of libraries into the digital realm not only opens learning up into different spaces, but it also provides different connected opportunities outside of the school. Hangouts Meet allows for synchronous video connections beyond the four walls of the classroom. This could include sending out an impromptu invite or scheduling an event beforehand. Whereas previously recordings had to be done using YouTube Live, users can now record with Meet and save to Drive. Virtual connections can be used to connect different classrooms, conduct virtual debates or provide an alternative point of access to classroom material. Google provides a number ways for sharing video for asyncronius connections. This could be as simple as a presentation with Slides or content added to a blog. Another possibility often overlook is the ability to create a shared channel in YouTube. This allows multiple people to manage things and passing on content if they leave. In addition to uploading video, a channel can be used to share curated playlists of appropriate content. An important topic with the increasing influence of algorithms on what is shown on YouTube. Finding a class to partner with virtually AND activities to do together – Matt Miller shares a number of strategies for partnering with a virtual class, as well as a number of activities to explore. Do You Have What It Takes To Be The Next World Booktalk Champion??? – Brad Gustafson shares another booktalk challenge. Gustafson facilities so many great global projects, all documented on his site. Google Cultural Institute Puts Us All Onstage – Michael Cooper explains how the cultural institute allows you to go beyond a simple walkthrough of places on YouTube to being able to move around the ballet or through a gallery using the technology developed for Google Street View. Creating Virtual Reality Content in Minecraft with Year 4 – Lee Hewes explains how his students created virtual reality content within Minecraft. So there it is, a breakdown of some ways that Google can be incorporated into the library. One thing to be mindful of is not every application is covered by the standard collection notice. I have also excluded some that I am unsure about from educational sense, such as Google Books, as they do not seem to be available in Australia. So what about you? Would you have structured things differently? Or maybe you have an activity that could be added? Or even a resource? As always, comments welcome or you could even write your own post and send me a webmention. A pack had an unmistakable impact on the park. These wolves had no idea about the scale of their impact. The wolves can’t not have an impact on the park. Basically, it seems that the wolves worked collaboratively to make a difference. That seems pretty fair. The only problem is that, as with most things, the reality of the wolves is so much more complicated. In an article in the New York Times, Arthur Middleton unpacks the great American myth surrounding the wolves in Yellowstone. He believes far too much has been invested in the role the wolves have had. We now know that elk are tougher, and Yellowstone more complex, than we gave them credit for. By retelling the same old story about Yellowstone wolves, we distract attention from bigger problems, mislead ourselves about the true challenges of managing ecosystems, and add to the mythology surrounding wolves at the expense of scientific understanding. A few small patches of Yellowstone’s trees do appear to have benefited from elk declines, but wolves are not the only cause of those declines. Human hunting, growing bear numbers and severe drought have also reduced elk populations. It even appears that the loss of cutthroat trout as a food source has driven grizzly bears to kill more elk calves. Amid this clutter of ecology, there is not a clear link from wolves to plants, songbirds and beavers. I think that this same concerns could also be raised in regards to education. Too much of what passes for professional collaboration equates with loose or unfocused professional groupings, partnerships, or networks. Take a simple example, holding a meeting with two or twenty will make no difference if those in the group are not adequately given the opportunity to add their voice, where instead only one person speaks the whole time. In some ways this touches on John Hattie’s argument that class size has little impact if it is not also attached with a change in pedagogy. Bringing a sociomaterial sensibility built on actor-network theory to this study positions me in a particular way. This eschews the notion of a pre-existent reality ‘out-there’ waiting for the knowing subject to discover and explain it. Nor is reality constructed by the distant researcher through a set of discursive practices. Instead, reality is performative, brought into being as a result of the relationships which form and reform when actors, both human and nonhuman, intra-act. As a researcher of and with teachers using Twitter then, I am entangled with a heterogenous mix of educators, software platforms, digital devices, terms of service, time zones, screens, hashtags and notifications. What emerges from the study depends on the knowledge practices which are brought to bear, but these do not solely involve a researcher, research participants and standard qualitative methods, but also an eclectic mix of other nonhuman actors. Together their relational performances constitute ‘methods assemblage’ (Law, 2004), where different realities become enacted depending on the actors which participate. One implication might be that this should not be statement of my positionality, but of ours. This sphere of influence includes both humans and non-humans in an interconnected web of influence. Therefore, everything has an influence and to isolate one part will always be problematic. Reading the work of people like Benjamin Doxtdator, Naomi Barnes, Ben Williamson, Jon Andrews, Audrey Watters and Maha Bali has taught me the importance of being critical. I am not saying that teachers do not have an impact or that collaboration does not have the potential of being positive, but it is difficult to separate these things from the wider context. In some respects, Middleton’s post left me wondering what impact Yellowstone itself has had on the wolves? As Yellowstone can’t not have an impact, right? As always, comments welcome and webmentions too.